The Southland will again be doused Wednesday, with rainfall ramping up in the late morning and early afternoon and the heaviest rainfall forecast for late Wednesday evening and into Thursday, strengthened by an atmospheric river suffused with moisture. Scattered showers are expected during the morning commute but will begin increasing in intensity as the day rolls on, according to National Weather Service Meteorolgist Kathy Hoxsie. Several parts of Malibu impacted by November’s Woolsey Fire, which stripped many hillsides bare, are already under mandatory evacuation orders. In Orange County, scattered light showers are expected throughout the morning and early afternoon, with heavier rainfall arriving late Wednesday, NWS meteorologist Jimmy Taeger said. Thursday will bring the heaviest rain before giving way to drier conditions on Friday. 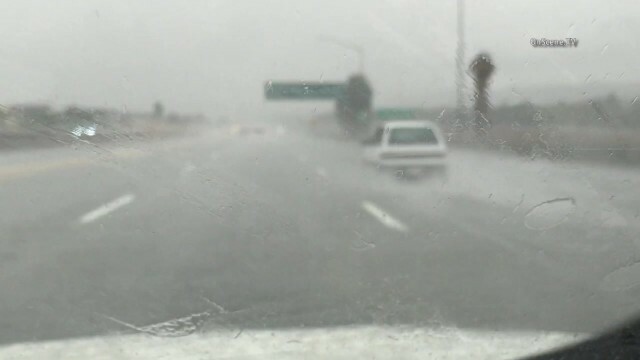 A strong storm cell moved through Orange County Wednesday night, dramatically increasing the amount of rainfall in the region. An inch-and-a-half or more of rain fell in parts of Fullerton, Yorba Linda, Anaheim Hills and two-inches of rain or more fell in Garden Grove, parts of Anaheim and Huntington Beach and 3.5 inches of rain was reported in Seal Beach, the NWS said.